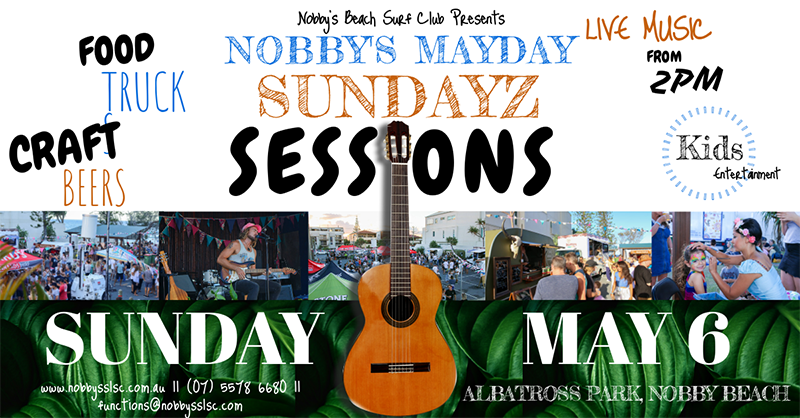 We are excited to announce the return of our awesome event – Nobby’s Sundayz Sessions! Celebrate this MayDay long weekend with an ice cold beer from our local craft breweries, delicious tapas from local food trucks and some chilled live Sunday Arvo tunes on the beachfront! And with kids entertainment in the park, it’s a great family friendly event!! Launching Sunday 6th May, 2018 at Albatross Park, Nobby Beach. Kicking off at 2.00pm, with live entertainment playing until 7.00pm, event finishes 8.00pm. T’s & C’s apply. Must have proof of ID/ Qld Membership. Gold Coin Donation/ $2 memberships. Capacity limits. This is a family fun event, we promote safe drinking practices. NO BYO – this is a licensed event. Don’t drink and drive – Courtesy bus available – 0410 662 297!